Description: Standardisation is a powerful tool to achieve better interoperability. However, it needs to overcome a lack of interest and modest participation from stakeholders. Also, promising research results are not always used as the basis for new standards. The overall goal of ResiStand is to find new ways to improve the crisis management and disaster resilience capabilities of the European Union and individual Member States through standardisation. 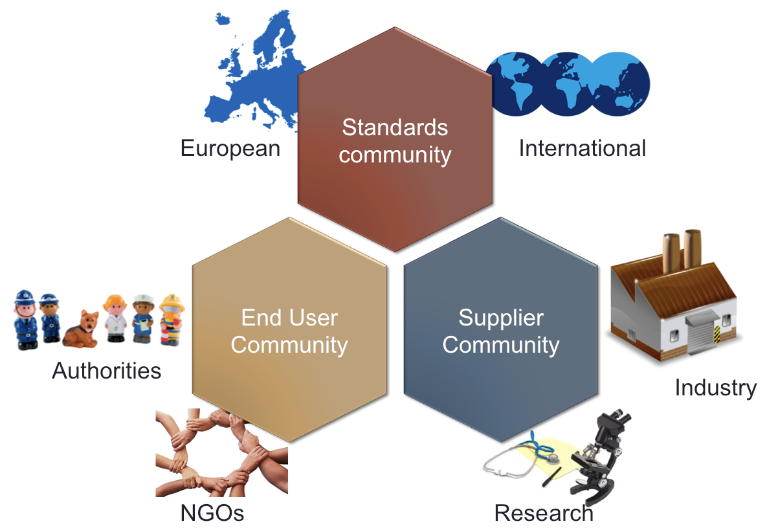 ResiStand contributes to an improved disaster resilience by identifying and analysing the drivers, constraints and expectations of three main stakeholder communities: Standardisation Organisations, End-Users and Suppliers, consisting of researchers, industry and SMEs. Based on this information, gaps in standardisation are identified and a prioritised roadmap for new initiatives will be created. The roadmap will be complemented by a critical evaluation of standards as a tool to improve disaster resilience. natural disasters, which have increasingly cross-border, even global consequences due to the on-going globalisation. Protection of citizens through anticipation, preparedness, response and adaptation to crisis situations – i.e. maintaining disaster resilience – will be more efficient. Collaboration between national, European and international stakeholders will be improved by unified processes and management systems as well as by technical, procedural, operational and semantic interoperability. Partners’ name/links: Geowise Oy, EU-VRi European Virtual Institute for Integrated Risk Management, Netherlands Standardisation Institute, DIN German Institute for Standardisation, Finnish Standards Association, TNO Netherlands Organisation for Applied Scientific Research, Fraunhofer Gesellschaft zur Förderung der angewandten Forschung, VTT Technical Research Centre of Finland Ltd, FFI Norwegian Defence Research Establishment, Atos Spain, S.A., D'Appolonia S.p.a., R-Tech Steinbeis Advanced Risk Technologies GmbH, Trilateral Research & Consulting LLP, Treelogic S. L.